The reference number of the map is shown in the upper left hand corner of the page. A number block in the lower right shows the Referee the rela tion of the map on that page to neighboring maps. 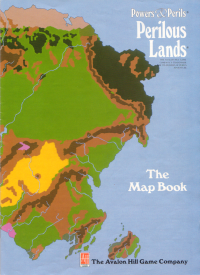 EACH map's reference number is used in the number blocks, in the Culture Book and in the Site Book. The index in the lower left lists each culture found on that map page and specifies the page in the Culture Book that their descrip tion is on. It also lists other maps that sections of that nation are on, if any. Arid areas with twisting ravines, rough conditions and unusual geological formations. Badlands are difficult to live in. Examples of this type of terrain are the American Badlands and southeastern Persia. Hot, and areas. There are two types of desert. The first is and with scrub vegetation and a good animal population. The other is Sand Desert. Sand deserts have little vegetation, are sparsely populated and are very hard to survive in. An example of the first type of desert is the American Southwest. An example of the second is the Sahara. The maps do not differentiate between the two basic types of desert. Forests have large animal populations and a good deal of vegetation. There are many different types of forest. These maps make no differentiation between them. For purposes of play Forests are easy to hunt in though visibility can be limited. Most have clearings of various kinds within them. Hills are an intermediate terrain type between mountains and other terrain types. In general they are forested, have a good animal population and range in elevation from 2,000 to 6,000 feet. Ravines, gullies and narrow valleys are common in hills. This symbol is only used to show the intensive agriculture zone outside of Fomoria (Map 2). This zone is the most productive field in the world, more than supporting the people of the island. Hot, humid areas with a large population of insects and reptiles, a good animal population and dense vegetation. Despite their lushness, most jungles are difficult to survive in because of poisonous creatures, severelylimited visibility and the necessity to gather many different foods to provide for basic dietary needs. The Amazon basin is a good example. Rugged terrain with high slopes, deep ravines and jagged cliffs. Most mountain areas have a mean altitude of 6,000 to 9,000 feet. Larger ranges can have peaks 15,000 to 20,000 feet in height. In general, mountains have a good animal population. They are dangerous because passable areas are limited and tend to leave the party few options. The Rocky Mountains and the Himalayas are good examples of mountain zones. Flatlands with sufficient moisture to support grass and low-lying vegetation. These areas usually have low, rolling hills and a good animal population, especially herd and pack animals. Visibility is almost unlimited. From a high hill a man can see for miles. Examples of a Plains area are the Russian Steppes and the Great Plains. Low-lying wetlands with dense vegetation and a great deal of animal life - The swamp zones shown on the map are great swamps with twisting waterways, bogs and other traps for the unwary. Swamps can be a deathtrap for those without expertise surviving in them. Good examples of great swamps are the Everglades, the Louisiana Bayou and the Pripyet Marshes. Frigid areas with perma-frost, frigid temperatures and horrible winters. Despite marginal survival conditions, animal life is abundant on the tundra. In the summer, the area has good vegetation. In the winter only scrub vegetation survives. Examples of tundra are northern Alaska, Canada and Siberia. NOTE - No encounter chart exists for tundra. If your adventurers go into this area you must provide your own. The common animals that can be found are herd animals (deer forms and bovine forms primarily), wolves, bears, tigers, ground nesting birds and eagles. Supernatural encounters possible are Frost Giants, Tonahs and creatures with cold powers. Creatures whose essence is heat or fire will not be encountered in tundra. Its essence is inimical to them. In general, supernatural encounters in Tundra are rare. Waterways are important to any area that they are in. Except for very and climates, the banks of a major waterway support good vegetation and a great deal of life. They tend to be a meeting place for the area, as all animals need water and, where herbivores drink, carnivores can kill. Visibility in these areas varies with the terrain. If the waterway is a river the same is true of the speed of its current. As a general rule, the closer it is to its outlet, the wider and slower the river will be. The closer it is to its source, the narrower and faster. The continental map is divided into sections to provide the Referee with a map of manageable size to use in play and, if the Referee so chooses, to restrict the party's knowledge of the continent as a whole. Where the maps do not fit your needs, or the world that you wish to run, modify them to do so. Each map has a hex grid. Each hex is 20 miles across. This represents, using the basic rule in Powers and Perils, one day's travel by a man on horseback and two day's travel by a man on foot (given a normal movement rate). The number block at the bottom of each map page lists the maps that border that map. Where the number box in a given direction is shaded, there is no land in that direction. Where a number is given, it is the number of the adjacent map. In all cases, the large number in the center of the block is the number of the central map for that block. The table below shows how the maps fit together. An -X- indicates an area without terrain in it. The numbers are the number of each map. 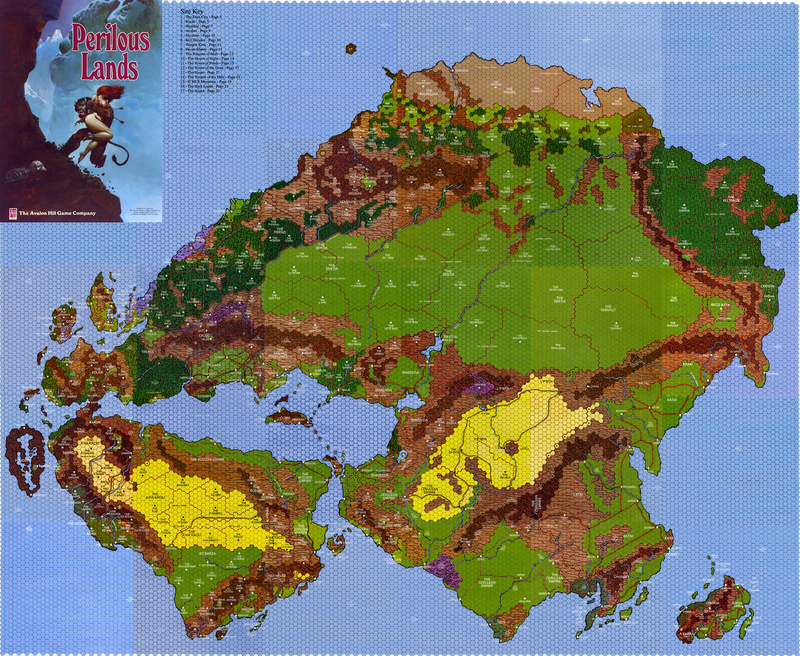 A very large world map (7MB) consisting of all section maps stitched together has been made by Floyd Resler and is available from his site or here. The Entire world map is also available as a clickable map interface to the 26 sub-maps.